Figure 3. In situ localization of pectic polysaccharides and extensin in medial longitudinal sections of 3-h-imbibed Arabidopsis seeds. A, Immunolabeling with LM19 revealed the abundance of unesterified HG in the endosperm. B, Calcofluor White labeled all cell walls. Labeling with anti-arabinan probes revealed the spatial heterogeneity of arabinan in the endosperm. 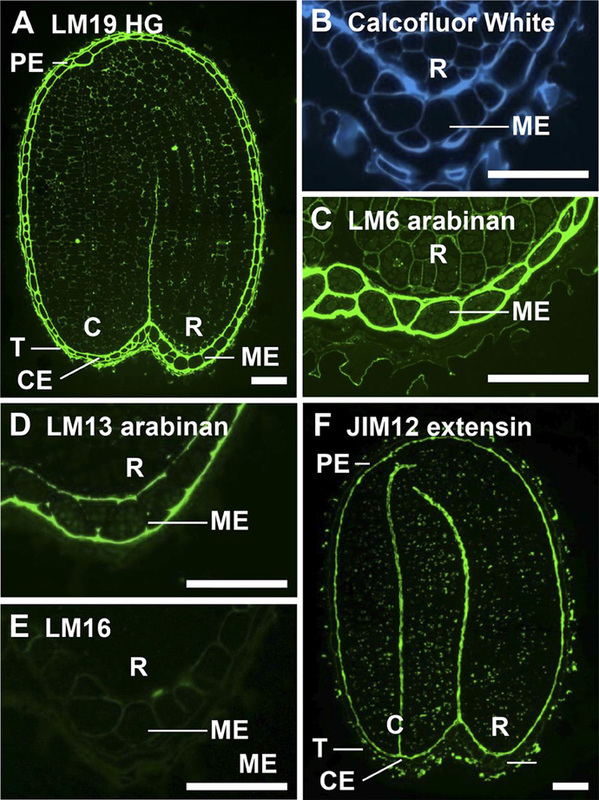 C, LM6 arabinan was uniformly distributed through endosperm cell walls. D, LM13 bound to the outer walls of the endosperm and weakly to transverse endosperm walls. E, The LM16 epitope was weakly detectable in endosperm walls. F, JIM12 labeling of extensin indicated restricted occurrence at the embryo surface/inner face of the endosperm and testa surface. C, Cotyledons; R, radicle; T, testa. Bars = 50 mm.